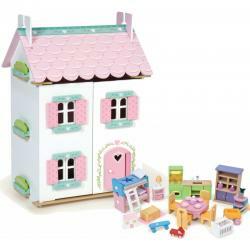 Dolls houses are a fantastic gift for any little girl. From the Tooky Toy and Hape Happy Family brands, we have a range of dolls houses as well as dolls, furniture and accessories to go with them. The history of dolls houses or miniature homes date back to the 16th century and today they're as popular as they've ever been. Dolls houses can really absorb the minds of girls and provide hours of playing-alone time.